"Painting Today" to celebrate International Women's Day, The Meam, Barcelona. On the occasion of the celebration of 'International Women's Day', the MEAM, European Museum of Modern Art, will present the exhibition called “Painting Today”. It’s an exhibition of international female artists and the MEAM has commissioned curator Didi Menendez, from the community of artists PoetsArtists, to present more than 70 works that created in the genre of figurative contemporary art. The opening will be held on March 8th and will be on view until May. To be invited to participate in this once in a lifetime opportunity is humbling especially when I see all the other artists that I’ll have the pleasure to show with. I’ve long admired the Meam because of its dedication to figurative realism and understanding the value it brings to the world of contemporary art that has lost its way. Now in 21st century, figurative realism is ripe with opportunity and has begun to take a bigger part of the art stage. History is being rewritten to include women artists who didn’t get recognition. Personally, It’s exciting to be a figurative artist and a woman. It’s about time that our gender and artistic pursuits be acknowledged equally by the art world. I’m looking forward to going to Barcelona to participate in the opening and to meet many artists that until now I’ve only known online. I promise to take lots of photos and share them with everyone. Ciao for now! Ofelia Andrades, Tanya Atanasova, Kelly Birkenruth, Melinda Borysevicz, Jen Brown, Teresa Brutcher, Carmen Chami, Aleah Chapin, Catherine Creaney, Stephanie Deshpande, Marina Dieul, Michelle Doll, Kimberly Dow, Teresa Elliott, Nanette Fluhr, Tanja Gant, Arina Gordienko, Alonsa Guevara, Regina Jacobson, Aleksandra Kalisz, Lisa Keay, Lorena Kloosterboer, Francien Krieg, Shana Levenson, Rachel Linnemeier, Kathrin Longhurst, Alexandra Manukyan, Christina Grace Mastrangelo, Agnieszka Nienartowicz, Reisha Perlmutter, Kim Peters, Megan Read, Luanne Redeye, Stephanie Rew, Nadine Robbins, Anne-Christine Roda, Viktoria Savenkova, Sara Scribner, Victoria Selbach, Tina Spratt, June Stratton, Vicki Sullivan, Kimberly A. Torres, Lorna May Wadsworth, Patricia Watwood, Pamela Wilson, Natalie Holland and Anna Wypych. I'm pleased to announce that I am now represented by Anthony Brunelli Fine Arts in Binghamton, NY. I have long admired this gallery and they're a perfect match for my new work. 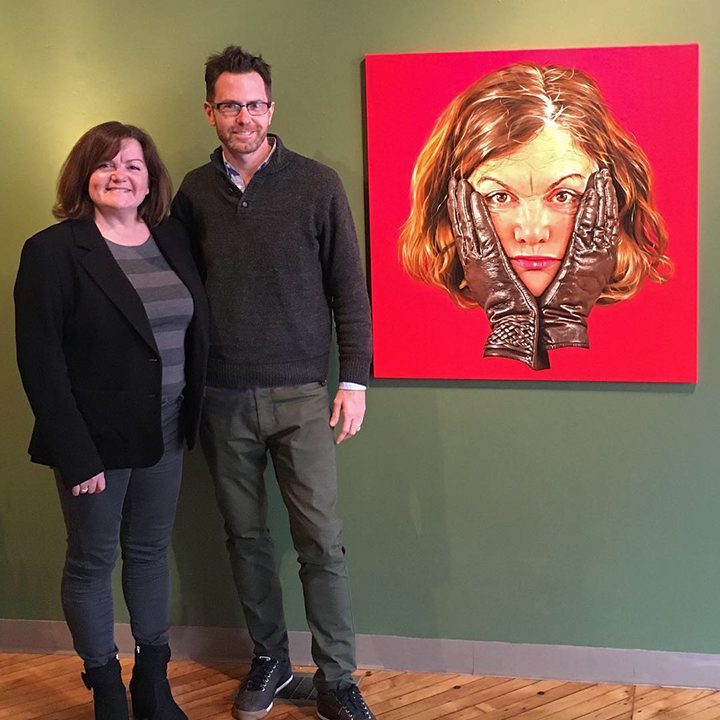 Here's a photo of John Brunelli, the director, and I next to my painting. It'll be on view in February at the Gallery which is located at 186 State Street in Binghamton. If you have any questions give John at call at 1-607-772-0485. Next up, my oyster paintings will be on display at Art Palm Beach starting 1/16/19. In an effort to promote women in the arts, I’ll be posting links to fascinating and informative articles about the patriarchy’s suppression of our gender and what is being done to change it. First up, an Artsy article about the Archives of Women Artists, Research and Exhibitions (AWARE) is a new online database was founded with the goal of rewriting art history from a more gender-equal perspective, focusing on self-identified women artists born between 1860 and 1972. For the full story click here. On display this weekend at The Millerton Moviehouse: The artists of the Hudson Valley: Norm Magnusson, Audrey Francis, Robert Hite, Roxie Johnson, and Nadine Robbins. 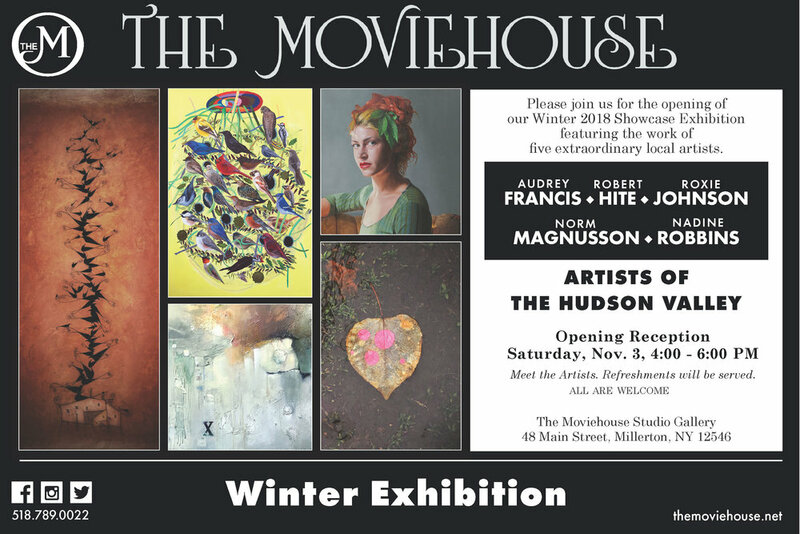 MILLERTON, NY---Continuing its mission to showcase the work of accomplished local artists, The Moviehouse Studio Gallery is pleased to announce the opening of its Winter Exhibition featuring the work of five outstanding Hudson Valley artists — Audrey Francis, Robert Hite, Roxie Johnson, Norm Magnusson and Nadine Robbins. It's been some time since The Moviehouse hosted a group show and we are delighted to be able to bring these five wonderfully talented artists to the region. Each of the artists featured live and work in the central Hudson Valley and each is a master in their oeuvre, but there are common threads that run through all the work on exhibit that speak to current social issues. Conceptually, much of the Audrey Francis' work explores not only her own Latina heritage but also the gendered language of the body and adornment in juxtaposition to elemental forms in nature. Nadine Robbins' work is decidedly at the intersection of identity politics presenting the feminine form in new and unexpected ways, allowing a dynamic to evolve between the viewer and the viewed, and as well upsetting the traditional roles of the male gaze and the feminine subject. Robert Hite's pieces contain sociological and humanistic themes and narratives. Images of structures, dwellings and living spaces have become central to his recent work. Roxie Johnson's work, although abstract and conceptual, is also deeply empathetic and humanistic, triggered by a word, a moment, an impression left behind with every mark clearly driven by emotion, intuition and the uncertainty in life. In his "Decorating Nature" series, Norm Magnusson aims to explore mankind’s complicated relationship with nature and our desire to make it conform to our demands. The exhibition delivers a visually vibrant and powerful treat for the eyes along with much food for thought. There will be an opening reception on Saturday, November 3rd from 4:00 – 6:00 p.m. to which all are invited to meet the artists. Refreshments will be served. The exhibition is free & open to the public and all works on exhibit are available for purchase. Audrey Francis began her artistic career with fine art studies at Syracuse University (BFA) followed by a residency at the Nantucket Island School of Design and the Arts, Massachusetts. Francis has taught painting at SUNY, New Paltz and design at Dutchess Community College. Formally trained as an illustrator, the artist’s established practice includes oil painting, collage, sculpture, and textile art. In her evocative paintings and mixed media works, Francis uses a sequence of motifs seemingly taken from deeply personal and mysterious iconography and pairs these with flat planes of color and pattern. Early work included hyper-realistic drapery studies and nudes and a series of pictures concerned with the tradition of Latin saints. Experiments with collage evolved into neo-surrealist works depicting fantastic interiors. Using oil medium as well as pastel, Francis’ photo-realist effect of light and drapery creates an illuminated sculptural study of figure, fabric, and space. Conversely, flatness is a guiding principal in her collage series and the most recent paintings. In these works, negative space is paired with figurative and abstract patterning in bright hues. Robert Hite was born in 1956 and spent his childhood just outside of Bowling Green, a small town in rural Virginia. During his formative youth, Hite traveled in the Caribbean, Europe, Asia, and South America. He spent a stint as a studio assistant for the Washington Color School painter Leon Berkowitz and enjoyed success in the eighties and early nineties as an abstract landscape artist in Washington, DC. Hite has shown his work widely, most notably solo shows at The Nassau County Museum, Berkshire Museum and Hancock Shaker Museum. Hite was awarded the Guggenheim Fellowship in 2014. Roxie Johnson holds an MFA in Illustration from Syracuse University and has worked as both fine artist and visual arts educator for more than four decades. Known for her unique approach to the etching process, Johnson has studied with master printers Ron Pokrasso and Dan Welden, and been the recipient of awards on both the east and west coast, twice from the National Association of Women Artists. It was during her printmaking career that her cut, paste and layering process developed through use of camera and digital technology and as she transitioned to abstract painting, her collage techniques remain prevalent as one of the trademarks of her work. Norm Magnusson Norm Magnusson is a New York-based artist and political activist and founder, in 1991, of the art movement 'funism', he began his career creating allegorical animal paintings with pointed social commentaries. Eventually he became more and more interested in political art and its potential for persuasion, but he always likes to retain a certain whimsy and humor in his work. In his 'Decorating Nature' series of photographs, Magnusson paints on, or colors, pieces of nature, like adding stripes to a fallen leaf, painting a pine cone blue or drawing concentric rings on a stone. Magnusson says that "We use nature how we see fit: we strive to bring order to it, we try to make it prettier, we try to make it more profitable." The images in the series are all about those things ­— but also about beauty. For Magnusson, beauty is the friend of consideration. "If a picture is pretty, the viewer will spend more time with it. If a viewer spends more time with it, they will begin to think beyond the surface of it and, perhaps, begin to consider the deeper meaning of it." Nadine Robbins' contemporary style is distinguished by a masterly command of academic painting techniques paired with an irreverence for rules, gender and beauty. Much of the painter’s practice focuses on themes of defiance. Robbins has earned great admiration for her iconoclastic nudes, as well as an ongoing series of portraits that oscillate between the mysterious and the candid. Robbins’ use of luscious jewel toned paint and high-fidelity realism ties the artist to the late twentieth-century and contemporary traditions of hyper-realism, photo-realism, and super-realism. Robbins’ montage-like use of atelier technique and way of working adds a studied complexity that is enticing and refined. As well as a solo exhibition at Brill Gallery, Massachusetts, 2009 Robbins has shown widely in group shows such as Perspectives of the American Experience, American Women Artists, Rockwell Museum, Corning, New York, 2018; Figurative Masters, Arcadia Contemporary, Culver City, California; The Wausau Museum of Contemporary Art, Wisconsin; Women Painting Women, RJD Gallery, South Hampton, New York; The 12th Annual Group Show, International Guild of Realism, Winfield Gallery, Carmel, California; Dissent; Sparrow Gallery; Attention to Detail, Robert Lange Studios, Charleston, South Carolina and Formation, A Painting Survey in conjunction with Poets & Artists, Bernarducci.Meisel, New York.